TDK has commencing shipping recordable Blu-ray discs. 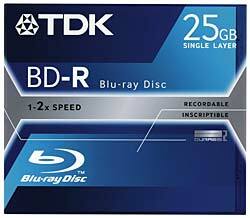 Its initial two offerings are a 25GB BD-R (Blu-ray Disc Recordable) and a 25GB BD-RE (Rewritable – so why not ‘RW’?) Australian US prices will be $US19.99 and $US24.99 respectively. Clearly, that’s pretty pricey, but who can remember the cost of DVD-R discs when they first appeared? I seem to recall that they were around $AUS15 each. Now, buying a quality brand like TDK on spindles, they cost under a dollar each. Anyway, if you consider that one 25GB BD has more than five times the capacity of a single layer DVD-R, they don’t seem so expensive. This release isn’t the end of the story. The Blu-ray specification provides for multiple data layers, so later this year TDK will be releasing dual layer 50GB versions of both the recordable and rewritable discs (priced $US47.99 and $US59.99). That’s interesting. There are still not rewritable dual layer DVD+/-RWs available, and I suspect there never will be now. The rewritable discs are said to be good for at least 10,000 rewrites and TDK puts the archival life of both kinds at fifty years. UPDATE (Tuesday, 11 April 2006, 3:45 pm): Whoops. The media release apparently emanated from the US, so the discs won’t be appearing in Australia for a couple of months yet, and as the above is US pricing, they will no doubt cost more in Australian dollars. I’ve edited the above slightly to correct this. Strikeouts and reds show the changes. This entry was posted in Blu-ray, Recorders. Bookmark the permalink.